The Limey Hedgerow was created one Sunday afternoon, after a large roast lunch Alex and I were playing around with various spirits and liqueurs trying to create a tasty cocktail. The idea originally came from an old recipe for a lime and blackberry pie. If the flavours worked well in a pastry then they could work in a cocktail glass. The lime being the only incongruence in an otherwise very English drink. The idea behind the name was the combination of lime with traditional Autumn berries foraged from English Hedgerows, hence a Limey Hedgerow. 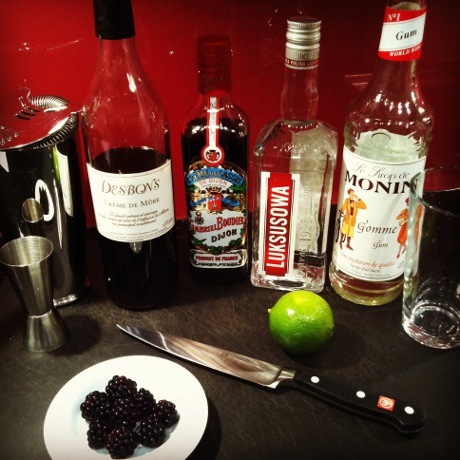 This recipe does call for two liqueurs, Crème de Mûre (Blackberry) and Crème de Cassis (Blackcurrant), however they are both quite easy to find and can be used in a range of cocktails including a Bramble and a Kir Royale. For a complete English Autumnal experience add a couple of shots of apple juice. Cut a lime, and squeeze a shot into the glass half of your shaker. Pour in the Vodka, Crème de Mûre, Crème de Cassis, Sugar Syrup and shake with ice. 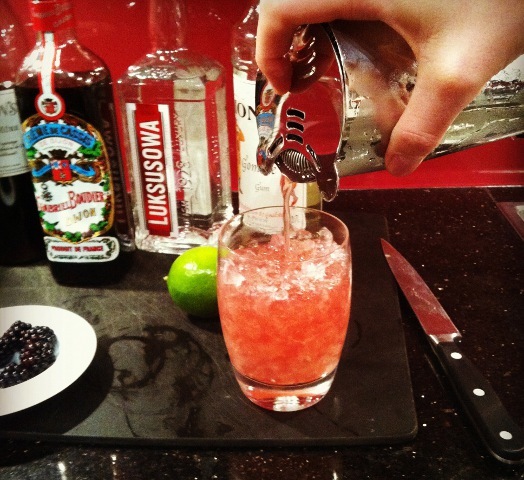 Crush some ice, either using an ice crusher or by bashing ice wrapped in a kitchen towel. Place the ice in an old fashioned glass and pour in the cocktail. 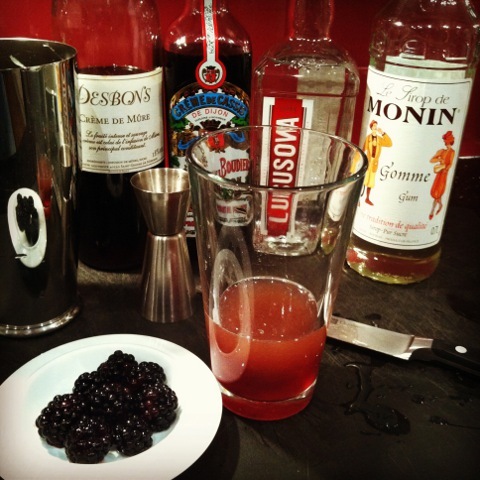 Add blackberries to garnish. If you prefer a slightly longer drink, you can add a further autumnal twist to the Limey Hedgerow by adding two shots of cloudy apple juice. The combination of the berries and apple works brilliantly.